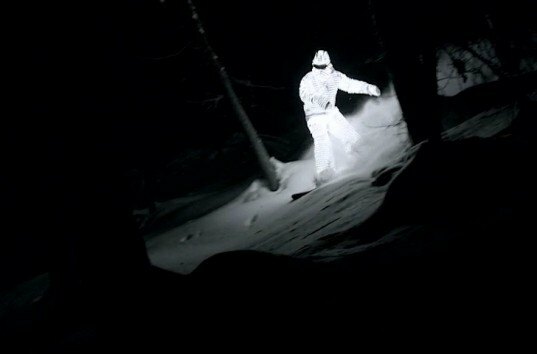 World-renowned fashion photographer and filmmaker Jacob Sutton shot this incredible film of a ghostly snowboarder wrapped in glowing low-energy LED lights swooshing through snow and trees at night. Sutton told Nowness that he always dreamed about an illuminated figure breezing through the dark alone, so he commissioned John Spatcher to design this incredible suit wrapped in LED lights, which pro snowboarder William Hughes donned before hitting the Tignes slopes in the Rhône-Alpes region of south-eastern France. Check out Sutton’s incredible “Glowing Man” video after the jump. Sutton used a Red Epic camera to make this film, a $58,000 piece of equipment that captured the Artec-sponsored snowboarder navigating the last of France’s winter snow. The entire project was commissioned by Nowness – an online platform that documents stories in the luxury world of art, culture, design, fashion, food, film, and more. Although this shoot probably cost enough money to feed an entire Ethiopian village, we are big fans of LED lights here at Inhabitat and we really love that they are getting such inspiring attention from the “bespoke” community. World-renowned fashion photographer and filmmaker Jacob Sutton shot this incredible film of a ghostly snowboarder wrapped in glowing low-energy LED lights swooshing through snow and trees at night. Sutton told Nowness that he always dreamed about an illuminated figure breezing through the dark alone, so he commissioned John Spatcher to design this incredible suit wrapped in LED lights, which pro snowboarder William Hughes donned before hitting the Tignes slopes in the Rhône-Alpes region of south-eastern France. Check out Sutton's incredible "Glowing Man" video after the jump.